Parsec 2 is the futuristic sound of additive synthesis for the Reason Rack. With two independent sound engines, up to 1024 oscillators per voice, a wide range of sound sculpting tools, built-in effects and free modulation routing, Parsec won’t leave you wishing when it comes to sonic horsepower. 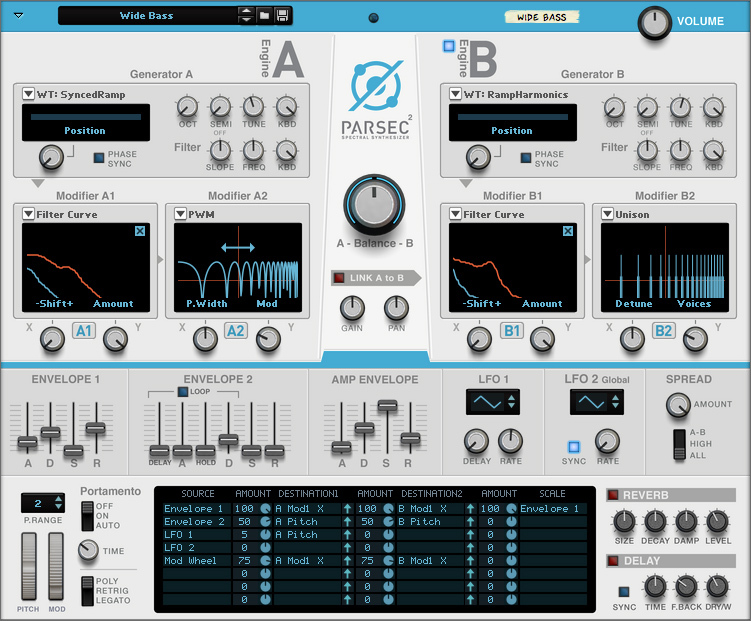 Boasting a state-of-the-art synthesis engine and an easy-to-grasp user interface, Parsec was designed for the novice and the PhD of sound synthesis alike. The sound bank packs several hundred patches across styles ranging from organic instrument sounds and crisp, digital synth sounds to ethereal sonic landscapes, will serve as an excellent starting point to explore the sound of Parsec. Once you are ready to dive further, the inviting interface will have you creating your own otherworldly sounds in no time. The new version takes Parsec’s sonic exploration tools even further with added generators, modifiers and more. Sound starts at the Generator, one per sound engine, each boasting up to 512 partials per voice. The generators have 48 different algorithms for producing sound. New in Parsec 2: 36 new algorithms, including resynthesized acoustic instruments and all the wavetables from Reason’s Thor synthesizer. Each sound engine has two modifiers that helps sculpt the sound from the generator. There are 27 modifier programs to choose from. Each modifier has two tweakable parameters. New in Parsec 2: Five new modifiers, draw curves directly on screen and get visual feedback on all parameters. Parsec comes with tons of high quality patches in a wide range of styles–from natural sounding instrument sounds to otherworldly sonic textures. New in Parsec 2: 250+ new expertly crafted patches. As the name suggests, this knob sets the balance between the two sound engines. New in Parsec 2: Enable this to connect all four modifiers in series. Set the stereo width of your sound. New in Parsec 2: New spread modes let you control the way sound is placed in stereo. Two LFOs for modulating sound. You select what to modulate in the modulation bus. The envelopes can be freely routed to any modulation target in the modulation matrix. This envelope controls the amplitude of both Sound Engines. A high quality reverb and delay unit is included to give the Parsec sounds a final touch. This Envelope can be routed to anything in the modulation matrix. With its loop mode, it also doubles as a third LFO. In the modulation bus, you can connect all of Parsec’s modulation sources with modulation targets. For instance, selecting an LFO as source and a modifier parameter as target will make the LFO control that parameter. New in Parsec 2: New mod sources and destinations. Set destination parameter with click-and-drag. Boosts the amplitude of the outgoing sonic output, or in layman terms: makes it louder. Parsec uses additive synthesis to generate sounds. Additive synthesis is based on a large number of sinewave oscillators that can be introduced in the sound—at various times, levels and durations. The big difference, compared to subtractive synthesis, is that overtones are added to a basic sinewave signal to form complex signals—instead of subtracted by filters from complex signals. In practice this means that you can tailor-make the frequency content in your sounds a lot more precisely with additive synthesis than with subtractive synthesis. The sonic results of additive synthesis can vary dramatically; from standard “analog” type of sounds to extremely complex and animated timbres.